Yes, ‘logic’, I know. Thanks. “But, think how much fun it will be” said the ‘other’ voice. But, when doing any adventurous sport, whether it’s skydiving or parasailing, you really have to find the balance between safety and fun. 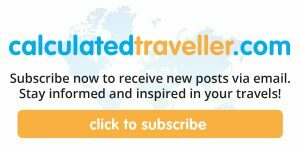 As a writer, I work to stay true to what I believe and do on Calculatedtraveller.com. I want to find adventures for me and my family, but I also believe that balance is necessary and calculated for everything in life. This held true for parasailing too. As much as I like adventure, I am an adult. An adult with a family, a kid, and lots of opportunities that come with all of it—I also have responsibilities. I like to think I’m an informed, educated adult—most of the times. So, when my family and I decided to go to Hilton Head, South Carolina, I knew that I wanted to go parasailing. But, I wasn’t doing this adventure alone. My family was coming up with me as well so I had to listen to ‘logic’ even more and do some research. I read the news, just like any red-blooded adult does. I’ve read about parasailing accidents and know that they do happen. I did my homework. Then, ‘logic’ gave me the thumbs-up. I’m in! I chose Parasail Hilton Head for my adventure. Just before parasailing, one of the crew members, Ethan of Sky Pirate Parasail Hilton Head, also did a complete safety check. He explained that, in the event of an accident (which he also explained was highly unlikely), we should unclip ourselves from the main harness, which is attached to the parasail wing, so that in the event that the wing did go into the water, we didn’t want to be pulled down with it too. Makes sense. He also explained how to properly land. Pretty simple. When they pull you back in, you land on your feet. And then he eased my worries, just like the man who I tandem skydived with did when he ordered an ice cream cone before jumping—he instilled confidence by not only showing me how laid back he was but confident too by joking, “even if you do wipe out while landing, don’t worry, we won’t laugh. Promise.” There is just something about a person, faced with a (somewhat) risky business that stays calm, cool, and collective—and that can interject humour—that makes you feel at ease. I gave ‘logic’ enough of a nod. Now it was time to just have fun and listen to the ‘other’ voice. Standing on the very back edge of the parasail boat, strapped to the parasail wing, slowly feeling my toes, then my entire body, lift off of the boat, I knew, I did my research. I also knew that I no longer had control—I just needed to enjoy the ride! Soon, the people that we saw on the boat, became just specks. But what becomes more vivid is the landscape. You can see out for miles and miles along Hilton Head’s Shelter Cove Marina and the Intercoastal Waterway. You can see the tops of trees, the curves in the water, and even though the day we went out was cloudy, you could see just how amazing the sky was too. Do you think there are sharks in the water? 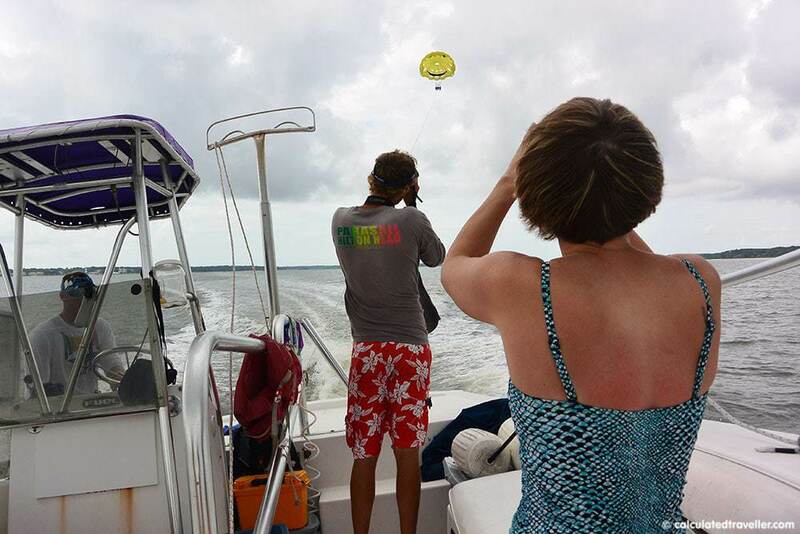 You have the option during parasailing with Sky Pirate Parasail Hilton Head, to be ‘dipped’ into the water. We decided that we wanted to dip. So, when she asked this question, my answer was: yes and yes. “Yes, we are safe and yes there are sharks in the water. But, we are moving so fast the sharks can’t keep up.”(Don’t criticize, sometimes, as a parent, you have to improvise). Ok, I can’t say that there is 0% chance of anything going wrong. There is a chance. But do I recommend parasailing with Parasail Hilton Head? Absolutely. On the way back from parasailing, listening to the crew member Ethan explain interesting facts about Shelter Cove Marina, like the fact that the late, great comedian Bob Hope lived there and his family still enjoys the grounds, as does Hall of Famer and Wimbledon champion Stan Smith, you can’t help but sit back, relax and listen, like we did, to the tunes of Bob Marley …“Don’t worry, about a thing, cuz every little thing gonna be alright.” As paddle boarders and kayakers, and the occasional dolphin pass by. There are up to 7 tours per day, starting at 8:00 a.m. Note: Sky Pirate Parasail Hilton Head also offers jet skis and banana boating at their Savannah location. Single flyers must weigh a minimum of 150lbs. Passengers may fly double or triple as long as the combined weight does not exceed 450lbs. Note: This was a complimentary tour in exchange for this review. The opinions expressed, positive and/or negative, are entirely that of the author and are not a reflection of the compensation received. 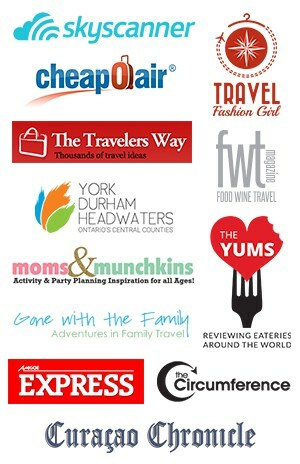 Kim Humphreys is a Toronto, Ontario, Canada based travel-blogger/adventure seeker. She sees vacations and traveling as a chance for a new opportunity and making memories that she and her family will never forget. We did parasailing in Maui a few years back and loved it! Great views and it is just a lot of fun. 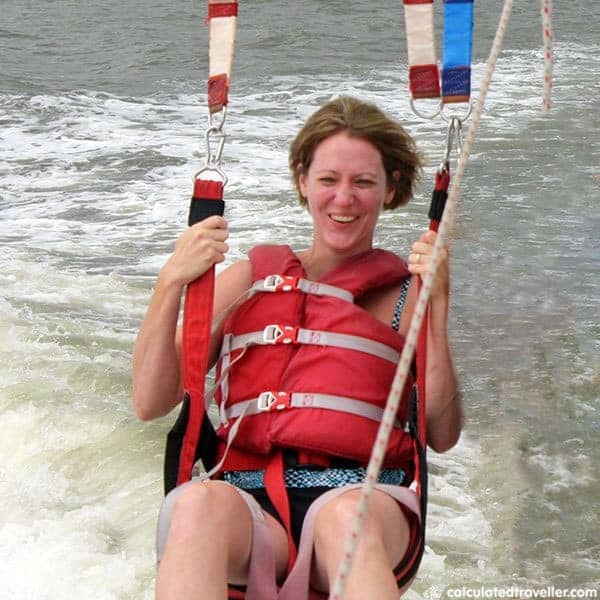 Jennifer, Maui plus parasailing…sounds absolutely amazing! Glad you had so much fun. I can imagine how wonderful the view was! Hi Marina, thanks for your comment. Sounds like now is an excellent time. If you go, I would love to hear what you think about it! I did parasailing once in the Bahamas, it’s very safe and fun! It’s been like 20 years since I did it. I think it’s time to do it again. Wow! So cool to have a bird’s-eye-view from above. Loving the smiley face parasail. Cute. Thanks, Angela. It really was fun and worth a try!